but then again I can't remember the last game of this genre that was better. It certainly wasn't Devil May Cry 4. The best I can come up with is Godhand, but that's stretching the definition of "genre." I hope this game finds the commercial success it deserves. This is basically the best action game I've played since, um, ever. The aesthetic of the game might not be your cup of tea, but at least it's not Dante's Inferno. My enmity towards that game comes solely from the previews and screenshots, but it's a powerful enmity, and if that grotesque slab of cynicism outsells Bayonetta, the world will have officially gone bananacakes. 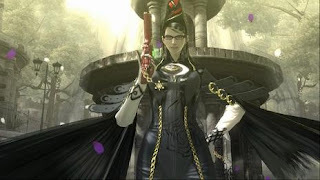 I like Bayonetta a lot, though I'm not sold on it being better than DMC4. I'd definitely say my initial playthrough of Bayonetta (on normal) was more fun than my initial playthrough of DMC4. My worry lies in the fact that on Bayonetta's harder difficulties, certain enemies are immune to witch time (and on the hardest difficulty it's completely disabled). This seems like a terrible design choice, as it doesn't just make the game harder, but less fun by eliminating the game's core mechanic. By extension, DMC4 had a lot of problems the first time through: recycled environments and enemies, unclear level design, tedious fetch quests, unbalanced difficulty, etc... Oddly enough, all of these nitpicks went away on the harder difficulties. You still had to fight all the same enemies and bosses as Dante, but realized that you had to employ vastly different strategies- something that made me appreciate the boss design all the more. The obscure puzzles were no longer an issue as after the first time, I knew where to go. And the move set got more complicated, so playing as Dante was a far more interesting challenge than the button-mash-fest it was on normal. I'm only midway through Bayonetta on hard and still liking it a lot. I'm just not sure the game's legs are as long as its heroine's.